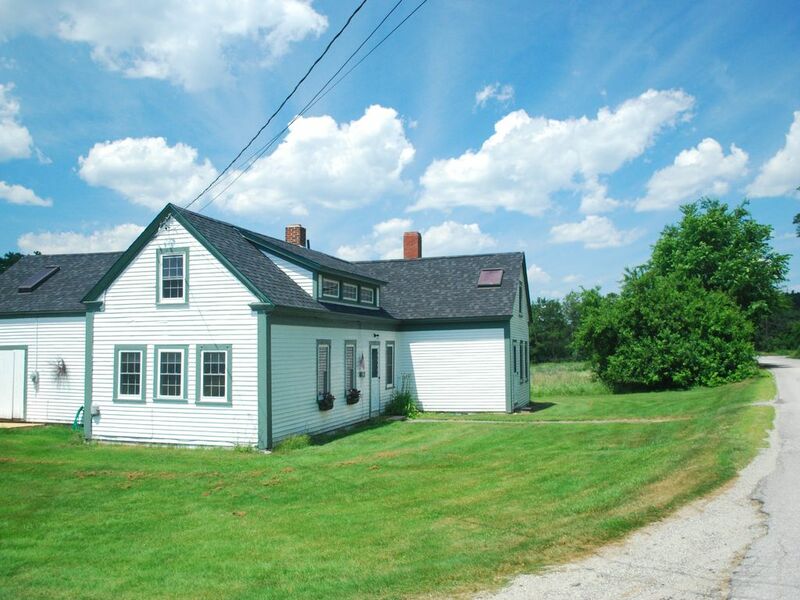 This is a newly renovated mid 1800s New England farmhouse. It is a mere 5 min. drive/20 min. bike ride to the local beach, which offers a great kayak launch, beautiful walk, or sunbathing/ swimming; and Lamoine State Park, which offers picnic areas, boat access, and pier fishing. The property is a scenic 15 min. drive from Mount Desert Island and a 25 min. drive from Bar Harbor and Acadia National Park. The farm house is located in a quiet neighborhood that gives you the old New England charm of quiet days and easy growing up. It's also just a 10 min. drive from Ellsworth which offers boutique shopping amid its old New England brick buildings, grocery shopping, and rainy day entertainment. The Downeast area is still a great antiquing destination. With tons of antique shops, yard sales, and country estate sales, the bargain hunter is sure to make a find. My wife and I bought this farmhouse because we saw the potential it had and wanted to remodel it to to make it a space we would enjoy. It is a wonderful old house with lots of history. It took way too long to remodel...8 years. I found I just didn't have the time to put into it that I thought. It was a wonderful project and we enjoyed the entire process. As we remodeled it, we wanted to do it in a way that we'd be very happy and comfortable to live there ourselves. We've succeeded in doing that. The house has all new plumbing, heating, electrical, windows, roof, kitchen, 2 new bathrooms. The floors were sanded to bring out the original beauty of the wood. Since we live just down the road, we felt this property made sense to purchase. We knew the previous owner and wanted to continue to care and appreciate the house as he did. His family had owned it for 2 generations, and their family added the dustpan dormer on the front of the house to enlarge the upstairs bedroom. They loved the house and it has been a wonderful house to remodel. Off the kitchen there is a nice shed or mud room, if the weather is inclement, it is a place to take off wet clothes or muddy shoes and boots. The farmhouse also has a unique white cast-iron farmhouse sink, large with cast-iron sideboards on either side of the sink. There are many nooks and crannies that are exciting and unusual for the kids to explore. It truly is one-of-a-kind. toilet, combination tub/shower, Bathroom #1 is on the 1st floor near the master bedroom. toilet, combination tub/shower, Bathroom #2 is off the 2nd floor north bedroom. toilet, shower, Bathroom #3 is located off the 2nd floor south bedroom. The Farmhouse is located near the ocean. There is public swimming at Lamoine beach just 5 minutes by car. Our Farmhouse is located in a quiet rural neighborhood where the neighbors are friendly and welcoming. The house is away from traffic and is in a prime location. The town of Lamoine has 1,600 people. The elementary school is 1/2 mile from the house and has a wonderful playground for children. Hot water baseboard throughout the house. The house is insulated and warm in the winter. Park on or near the lawn next to the attached barn. Full sized side-by-side refrigerator/freezer with ice and water in-the-door. built-in microwave over the stove. Our Farmhouse kitchen has the original enameled cast-iron country-style sink, with cast-iron drainboards. Our kitchen designer captured the essence of yester year while giving cooks a great kitchen. The current dining room table will seat eight people. Additional space is available in the kitchen with two stools at the counter. There is a lawn on all side of the house, plus a small garden near the barn. Dining area seats 8, audio tape player, radio, activities guide, local activities guide, local maps, restaurant dining guide. Alarm clock, cold water dispenser, filtered water. Central heating, summer garden. The home is an old renovated home with the charm of an old home but it also has the limitations of an old home as well. The upstairs bedrooms are not accessible for people with any physical limitations. The owner was very nice and responded very quickly to any questions. Being an old farmhouse, the house does have some unique characteristics. Besides all the many doors and door openings, the 2nd floor stairways are a little unusual. They are somewhat steeper than those found in today's construction. I can imagine they may be somewhat daunting for some folks as one stairway has winding steps. Guests have mentioned in the past how they love the old stairways...and how nice it is to have two sets of stairs. There is one stairway to each upstairs bedroom, which provide both privacy and safety. Really enjoyed the updated kitchen. Cozy gas fireplace. And all the wonderful chubby holes in this farmhouse. Brought back wonderful memories for my mom and aunts. The area is very beautiful to explore. The house was perfect for our family trip! The farmhouse was perfect for our family! We traveled with 3 kids, 4 adults and our dog and there was more than enough space for all of us. The home is well equipped with everything you need. Thanks to Ray for a perfect week! Very cozy and clean. Just far enough from the traffic of Bar Harbor and Acadia. Friendly neighbors. The house is stocked with anything you might need, sheets towels, pots and pans, etc... Beautiful setting, if you wake up early enough, you can see deer in the field behind the house. My family and I loved the farmhouse. Very homey, clean, everything you need. The location was perfect for us too! Library, playground, water parks, churches, marina, beachcombing, bird watching, walking, eco tourism, paddle boating, whale watching, gambling casinos, scenic drives, freshwater fishing, mountain climbing, roller blading, whitewater rafting, deepsea fishing, hunting small game, mountaineering, ice skating, sound/bay fishing, tennis, pier fishing, fly fishing, ATM/bank, laundromat, massage therapist, medical services, groceries, hospital.